A relatively new program called Ellp beta lets you automate specific actions on your PC. One of the more useful online services for getting things done is IFTTT.com, which stands for If This, Then That. For example, if rain is the forecast for tomorrow, then send me an email. A new program for the Windows called Ellp (currently in beta) is kind of like IFTTT for the desktop. It can’t carry out the wide number of actions that IFTTT can, but Ellp doesn’t have to. This program is more about managing actions on your PC than interacting with online services—though it does have a few features that are straight out of the IFTTT playbook. At this writing, Ellp has only 11 actions, but over time it will hopefully develop more than that. Some of the more useful actions Ellp currently has include the ability to automatically run disk cleanup once your hard drive gets too full. Ellp can also automatically launch a website when you plug in your headphones, warn you when you’re about to download the same file twice, and schedule your PC to shut down at a certain time. 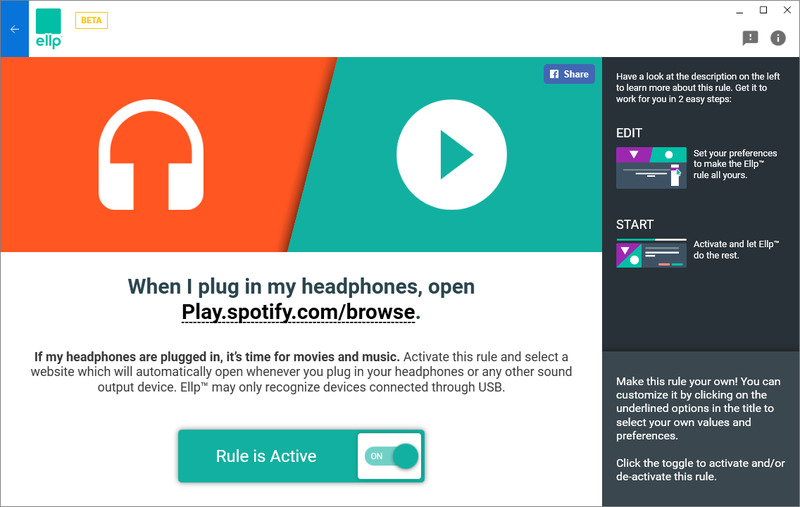 The Ellp option to launch a website when you plug in a pair of headphones. The program uses a card interface for all of its actions. All you have to do is read the options, click on the one you want, and then turn on the Activate slider. That’s generally about it; however, some settings may require more information. When you want to launch a specific website once your headphones are plugged in, for example, you’ll need to specify which website you want. Ellp offers some default options such as Netflix and YouTube, but you can specify other sites such as Spotify’s web player. It’s a shame that Ellp doesn’t offer to launch desktop programs when you plug in headphones, but perhaps that will come in a future update.